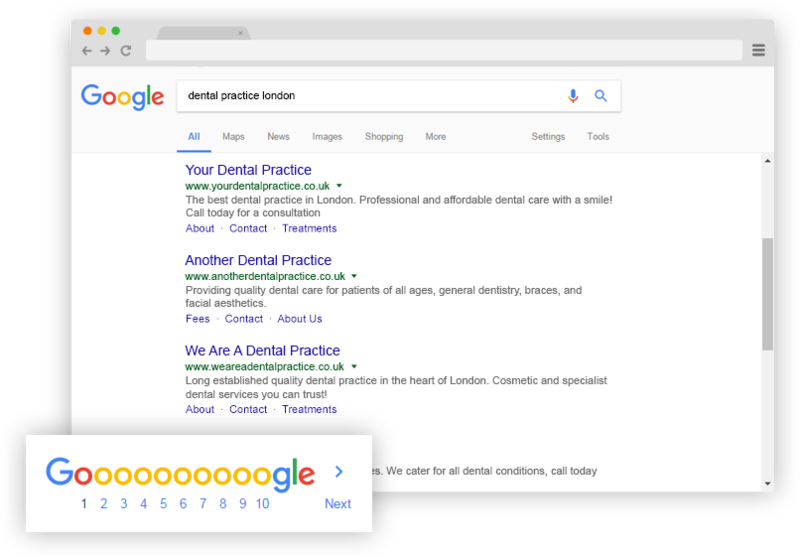 Dental SEO (Search Engine Optimisation) is the natural/organic process of positioning your website to rank highly on search results pages for the most relevant dental keywords. When patients search for a dentist then we want your website pages to show up first. It is not only something to do for your business online – it’s the foundation of your entire online dental marketing strategy. SEO is an on-going process that requires regular monitoring and updates; why do all the hard work to get you ranking well, and then let it slip in rankings when you stop SEO? Our dental SEO strategies are executed according to industry best practices. We conduct extensive dental SEO keyword research and competitor analysis for your field. The goal is to generate high quality visitors who fit the demographic and budgetary requirements of your business’ services. It is critical that your marketing strategy includes a consistent, effective effort that enables your dental practice to be found. The online industry as a whole works on SEO for organic searches; SEM is the paid searches. Some people like to keep both elements separate (and charge you twice), but we define SEM as a catch-all term to describe all paid and organic efforts that drive traffic via search engine results pages. Depending on the competitiveness of your market, it is often crucial for organic (SEO), and paid (SEM) searches to be incorporated into your online marketing strategy. Your paid and organic initiatives should work together to support one another. Plus having organic and paid listings near one another on a page actually increases trust, and accordingly, a greater click through rate for your organic links. We want to provide you with better value for money, so we provide all SEO and SEM services as part your online dental marketing.